Gina joined our practice in 1998. 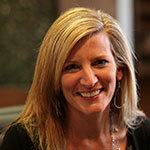 She is a member of our business staff and has worked in the dental field for twenty plus years. She started out as an assistant and when she joined our practice she moved to a front desk position. She has three children and will travel the world to see Maroon 5!